Reverend Van Smith, Jr. is the son of Arnetta and the late Reverend Van Smith, Sr. He is a native and resident of Plaquemine, Louisiana. Reverend Smith graduated from Iberville High School. He received a B. S. in Secondary Education from Southern University in 1960 and received a Master of Education Degree from Southern University. He has also completed post graduate studies at Nicholls State University and Louisiana State Universities. Reverend Van Smith Jr., was ordained into the Gospel Ministry in 1984 by the Iberville Parish Conference and the Fourth District Baptist Association. Reverend Smith attended Capitol Religious Institute. 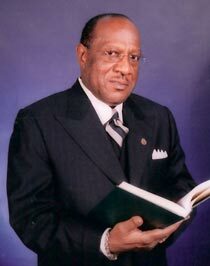 He became Interim Pastor of New Jerusalem Baptist Church in October 1985 and in December of 1985 he became the fifth pastor of the Church. Reverend Smith is a member of the Iberville Parish Ministers Conference, East Baton Rouge Parish Ministers Conference, the Fourth District Baptist Association, the Louisiana Baptist State Convention, and the National Baptist Convention U.S.A., Inc. Pastor Smith is a member of Widow Son Lodge #10 Prince Hall Masons, Plaquemine, La. Reverend Smith is married to the former Leola Robertson and they have three children, Van Smith III, Kimberly Carroll, and Kent B. Smith. They also have four grandchildren: Gabrielle, Bethany, Caitlin, and Nicholas. Reverend Smith is a retired school teacher of the Iberville Parish School System. He enjoys traveling, attending conventions, and his involvement in music. Above all Reverend Smith loves to spread the Word of God through his preaching, praying, singing, and playing music. A devoted pastor's wife, Mrs. Smith is dedicated, loving, caring, and an ardent supporter of her husband in his ministry. She assist the pastor in visiting the sick, consoling the bereaved and even in serving communion. Her role as a pastor's wife is to be supportive in the church in any capacity that she can be a source of help. She is a member of the Iberville Parish Conference Women's Auxiliary: Fourth District Women's Auxiliary and Fourth District Ministers Wives. 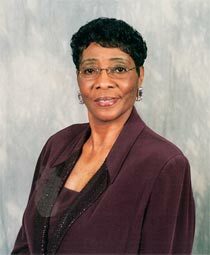 Mrs. Smith is a member of the Louisiana Baptist Convention Women's Auxiliary and the National Baptist Convention Women's Auxiliary. May God continue to bless and keep her.